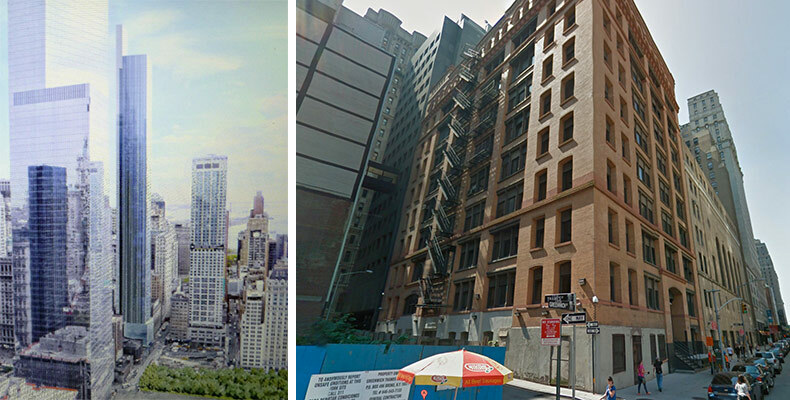 Initial rendering of 22 Thames Street (left; Courtesy Tribeca Trib) and a Google street view before demolition (right; Courtesy Google). Rafael Viñoly Architects has unveiled plans for a new 70-story residential tower located just a small block from the World Trade Center at 22 Thames Street. The developers are looking to replace the 10-story, former American Stock Exchange building with an 870-foot skyscraper. Fisher Brothers, who bought the site for $87.5 million in 2012, asked Rafael Viñoly to design the building and initial plans were presented to members of Community Board 1 last week, where Curbed and the Tribeca Tribune snapped photos of Viñoly’s rendering. The glass building would include space for 450 apartments and commercial use on the ground floor. Under the existing zoning, the developers have the right to construct an 85-story tower. However, the company unexpectedly has decided to build a shorter, wider tower better suited for the area. The layout would create space for more spacious apartments and not block the neighboring 1,776-foot One World Trade Center. The skyscraper would act as a transition between the soaring World Trade Center and the low-rise masonry buildings on Greenwich Street. The requested zoning variance would reduce the required setback of the building from 20 feet to 10 or 13 feet, allowing for a wider building. While the number of apartments in the building may change, at least 20 percent will be set aside for affordable housing. The project will integrate environmentally-friendly design and energy efficiency. In the fall, Fisher Brothers will supply a more comprehensive presentation to CB1’s Financial District Committee when it seeks advisory approval for the zoning variance. The city will make the ultimate decision regarding the zoning amendment. A Fisher Brothers representative has revealed a completion goal of September 2017, if all goes as planned.